Eliminates odors derived from perspiration;Mutes perspiration;Protects from the sensation of discomfort and humidity. 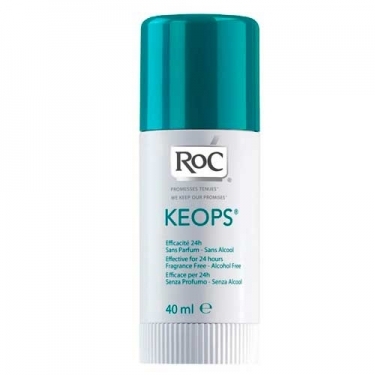 Keops Stick Deodorant from RoC is a stick deodorant indicated for normal to soft perspiration. Is indicated for the armpit area and can be used for more sensitive skins. Due to Roc's "complex odor picker" technology, this product helps eliminate perspiration-related odors. With anti-perspirant and deodorant action, it protects the skin from the sensation of discomfort and moisture. Can be used soon after epilation. Without perfume. No alcohol. It does not contain aluminum hydrochloride, so it can be used in children. Apply to clean and dry skin.Use whenever necessary.